This article has been updated. Click on this link to see the latest version. The market indices have fallen, and it seems like a good time to invest? But you’re not sure what to invest in? Should you choose just one or two stocks with good prospects, and invest a large sum? Or should you just choose a Mutual Fund, and invest in a lump sum, or even a SIP? I have another idea for you. Invest in a direct market SIP !! By this I mean, use your current Online Trading & Demat account to buy 5-6 shares yourself in a systematic manner every month. Only initial charges of 0.5 to 0.75% which are the brokerage commissions + taxes, compared to 2.5% per annum, which are the normal Mutual Fund charges. This really adds up over the years. A quick look at equity MFs performance over 3 years (from Value Research) shows that only 15/57 MFs outperformed the Nifty’s 5% gains over the last 3 years. Utilize your online trading account better, and gain control over your investments !! Do not try to time the market. 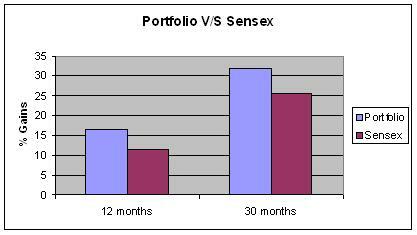 Instead by investing systematically, you can beat the Sensex in terms of returns !! Just one or two stocks for investing heavily – this may be too concentrated a portfolio. Even the largest and most stable stocks (think Reliance or DLF) can be victims of pockets of non performance, or worse, large unpredictable swings. Several brokerages – ICICI direct and ShareKhan for sure – have introduced Equity SIP facility for customers. My feel is a Do-It-Yourself approach removes these doubts and gives some satisfaction (while taking just 10 minutes a month). You will use your current Online Trading account/ broker relationship for this SIP. If you have to choose among your options, choose the one with lower brokerage. Could be ICICI securities, or Kotak securities, or whatever. Decide on the 5-6 stocks you will invest in. My help here – see next section – Choose your stocks. Decide on the amount you will invest every month – here I would suggest you fix an amount such as Rs 10,000 or 20,000 and keep up this amount every month. Create a small calculation excel for helping you decide the actual number of shares to be bought. See section – Here’s an example. Decide on a date for investing. If you are salaried, perhaps 2nd or 3rd every month is a good date as it is right after you have received your salary. Or any other convenient date. Keep a self reminder for this date. Choose large liquid blue chips. They should be Nifty/ Sensex stocks. You do not want too much volatility in your mutual fund. The 5-6 stocks should be from different sectors. Bad news in one stock / sector should not affect the other. Lets say you chose 5 stocks for your SIP – HDFC Bank, Infosys, L&T, ONGC and Bharti Airtel. Next you have chosen Rs. 20,000 per month for your SIP. Decide the date of the month you want to invest every month – say 2nd. Very important – stick to your monthly investing routine as far as possible. There you go – you are all ready. Nice article….i took my time in this sunday afternoon and searching an article on direct sip in stocks, making own portfolio…Really happy reading this….I want to invest 20k at the first sip then 5-8k sip each month ….what you say…is it good to be??? Yes. You need to choose your stocks well. Can you please tell BHEL or L&T ? Which is better stock in capital goods sector for long term SIP investment?